Longtime James Bond fans and followers of this website will be well versed in sniffing out the credible 007 rumours from the hilariously false. As soon as a new 007 film is officially announced, as was the case last week when EON Productions confirmed the release date of Bond 25, every 'entertainment' reporter in the newspaper trade tries to get a scoop on it. In the UK, Bond rumours are somewhat of a cottage industry in the press. As little may be set in stone this early in the pre-production cycle and real news hard to come by anyway, thoughts instead turn to wild speculation and reheating old tidbits such as titles, locations, and casting. Yesterday, The Daily Mirror went one step further and published a fabricated story by showbiz editor Halina Watts claiming that the new film will be based on the continuation novel 'Never Dream of Dying' by author Raymond Benson. "It is based on the 1999 thriller Never Dream Of Dying by US author Raymond Benson, who also wrote Bond books Tomorrow Never Dies, Die Another Day and The World is Not Enough,' the paper misleads. A 'source' told them: "Bond scriptwriters feel it could be the perfect follow-up to Spectre. They are hoping to film in Croatia next year." Not only did the paper get the year of publication wrong (it was released in 2001, not 1999 as they report), they also claimed that they spoke to Benson himself about it: "Author Mr. Benson said the film would hit cinemas in November 2019, with the film taking inspiration from the 1960s 007 outings You Only Live Twice and On Her Majesty’s Secret Service." Above: Spot the difference... The Sun copies The Mirror. The problem with this is that Benson never spoke to the Mirror. 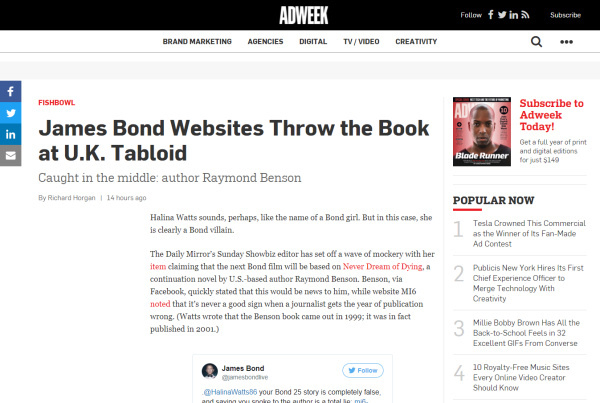 After being alerted to this by MI6 and a gaggle of other Bond blogs and community fans, Benson issued this statement on his Facebook page: "Some of you may have seen an article published by U.K.'s The Mirror yesterday that claims that the next Bond movie will be based on my novel Never Dream of Dying. I know nothing of this, but as I have not spoken with any Mirror journalists at all, I can only assume that the article is a piece of fabrication. It would, of course, be wonderful if it were true." It is poor form for a journalist working for a national newspaper to not even bother to check Wikipedia for the release date of a book from their source's 'hot tip', but falsely claiming to have spoken to a principal involved in the story and attributing commentary to them can be flat-out libelous. MI6 contacted Halina Watts yesterday via email, copying in the Mirror's editors desk and corrections desk, alerting them to the factual inaccuracies in the article. Nine hours later, Halina Watts herself replied with an attempt at an explanation: "This story was not fabricated. What was published in the paper was the correct article and somehow it got changed online - it is being corrected now! ...It's from a very good source. That the producers are very inspired and taken by Benson's books as well as the previous films mentioned in my piece." Clearly covering their backsides on lying about contacting the author, the Mirror has now removed the claims that they spoke to Benson, but amusingly, have not updated the goof about the publication date of the book. The edit to remove the phrase "Author Mr Benson said" is easily spotted as the hasty change omitted a space after a period. Readers can only conclude that they are not that bothered with accuracy, but they do worry about legalities (note: this is the same newspaper that has been sued multiple times in recent years for illegal phone hacking). The tale gets a little murkier as the paper has not stated this change in the article, merely removing the most offending phrase and updating the publication date on the piece. Responsible news outlets will state what amendments, corrections, redactions or additions have been made to an article after initial publication. Not the Daily Mirror. Click here to read their original version of the article, and here to see their updated version. What has yet to be uncovered in this tale is the original source of the false rumour. Most likely, someone emailed the Mirror's showbiz tip line with the claims of having inside information. The tag along points about Croatia location scouting and the perennial 'Shatterhand' title idea would easily pop up on searches and give some credibility to the tip (both of which have been covered by this website in recent days in anticipation of the tabloid free-for-all). If so, did they throw in the wrong date for the book as a test, or was it just sloppy? Sometime between the original version of the fake news being published by the Mirror and their weak attempt at a cleanup, The Sun hit the copy and paste button on the Mirror's story without any fact checking either. The story is now doing the rounds in the entertainment news echo chamber including outlets such as Esquire and NME. But too late for the Mirror, as some of the clones of the story were copied from The Sun's copy of the story. The horse had bolted. Trade publication AdWeek were watching this debacle unfold and published their take on the Daily Mirror and this fake Bond news story. 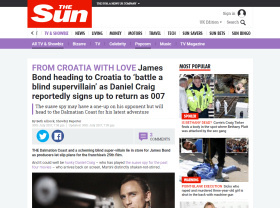 Have we reached the bottom of the barrel with tabloid coverage of James Bond? We doubt it. As the line from 'Tomorrow Never Dies' goes, "They'll print anything these days." There is a long road of debunking media coverage ahead of the Bond 25 initial press conference, which in all likelihood won't take place until December 2018. But taking a lesson from the Halina Watts debacle, hopefully, someone, somehow, does not add fake quotes and claims to this article when it gets published.